There was much excitement when the Juno spacecraft successfully arrived at Jupiter in July, after a five-year journey through the solar system. A perfect engine firing placed the solar-powered spacecraft into just the right orbit around the gas giant, with the promise of great discoveries to come. Now, 150 days into the mission, Juno should have made six or seven close fly-bys of Jupiter, which means flying through the point of its orbit that is closest to the giant planet. It is at this point that the spacecraft makes most of its important scientific observations. But in reality, we have had just one science-intensive fly-by so far (in August), with another planned this month (December 11). So what happened? Juno was originally injected into a 53-day orbit around Jupiter. The plan was to complete two of these long orbits while all the instruments were being checked, before firing the engine again in October to move the spacecraft closer to the planet in a 14-day orbit. However, shortly before the burn, the Juno team reported that two helium valves – which play a vital role in firing the main engine – weren’t operating properly. So instead of risking the spacecraft by firing the engine, the team decided to wait and analyse the issue in more depth. It’s always better having a healthy, working spacecraft than an uncontrollable one. That’s not to say that Juno will never reach the 14-day orbit, but we now expect to stay in this 53-day orbit for at least the first half of 2017 . But if we can’t figure out what’s going on with the valves, we could stay in this orbit indefinitely, as Juno doesn’t get any extra radiation exposure by doing this. From a science perspective, this change just means we’ll be taking data more slowly – with 53 days between each fly-by rather than 14. Juno will still achieve its full scientific potential, but we scientists will have to be more patient than we’d originally planned, as well as reworking all our carefully laid plans for Earth-based support . With the engine burn postponed, Juno’s science instruments were scheduled to provide complete coverage during the close fly-by on October 19. But Juno unexpectedly went into “safe mode” just 13 hours before the fly-by. Safe modes are designed into software in case the computer encounters any glitches. If this happens, everything non-essential is turned off, the computer reboots, the spacecraft makes sure its solar panels are pointed at the sun to maximise its power, and it awaits further instructions from Earth. Unfortunately, this meant that no science data were obtained. It came out of safe mode five days later, and mission managers are now being cautious about the next close approaches to avoid it happening again. Despite these setbacks, Juno has already provided unprecedented views of Jupiter that have only served to whet our appetite for what’s still to come when the spacecraft gets into its groove. During the first orbit, Juno was collecting a whole series of colour images that citizen scientists have assembled into a three-month “ marble movie ” – allowing us to ride along with this robotic explorer, watching the dance of the Galilean moons and the spinning of Jupiter’s dynamic globe. For me, the incredible thing about these images is the vantage point: from Earth, we only ever see Jupiter in full illumination, but Juno can provide a view that currently only this robot can: a crescent Jupiter. Then, on August 27, Juno swooped to within 2,500 miles of Jupiter’s cloud tops, revealing humankind’s best ever views of Jupiter’s north and south poles . Rather than the striped appearance that we’re all familiar with, the poles look completely different. There are no belts and zones up here, but a multitude of small-scale storm systems – giant swirling cyclones with pinwheel structures that presumably wander about the polar atmosphere over time. This is rather different to Saturn, where we see banding all the way to the poles and that bizarre northern hexagon . 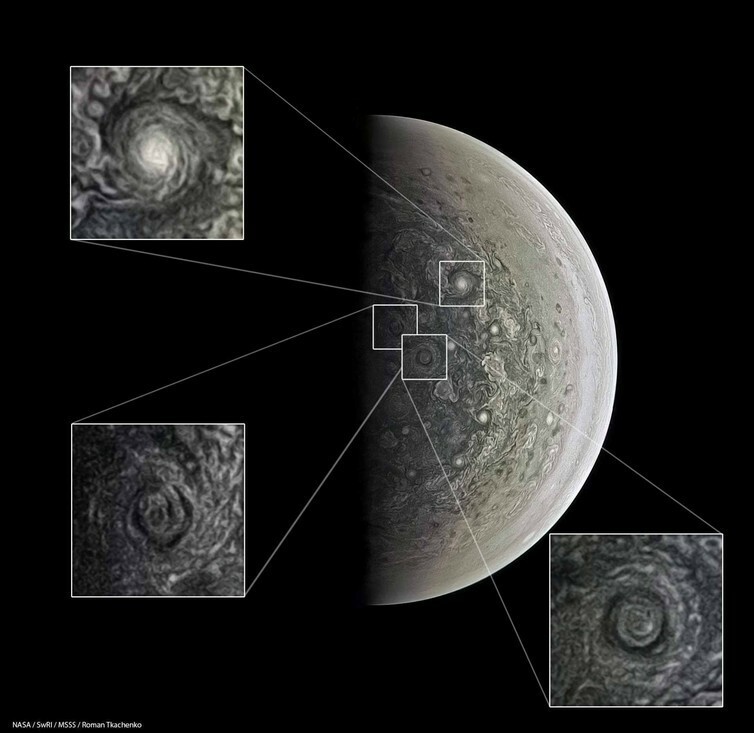 It’s quite clear from these early images that there’s no such hexagon at either of Jupiter’s poles. The images have also shown nightside clouds towering high over the horizon in the terminator regions, rather like clouds catching the last rays of sun before night. But Juno can do much more than take visible images. The JIRAM instrument from Italy has mapped the entire planet in the infrared , allowing us to see Jupiter’s glowing internal heat and silhouetted clouds in more detail than we’ve ever been able to from Earth. The unique vantage point allows JIRAM to see Jupiter’s aurora, glowing hot due to emissions from excited hydrogen ions in the upper atmosphere as they’re bombarded by electrons moving along the magnetic field lines. Not only can Juno see the aurora, but it can also listen to it . A radio wave detector can hear the emissions of the energetic particles that form the aurora, some of the strongest emissions in the solar system – giving us an impression of the structure of the plasma environment as Juno hurtles through the Jovian system. Among the most hotly-anticipated results are those from the Microwave Radiometer, which is able to peer deeper inside Jupiter than ever before, probing hundreds of miles below the topmost cloud decks to reveal the inner workings of the giant planet’s atmosphere. Even from a single fly-by in August, Juno has discovered that Jupiter continues to exhibit some kind of banded structure all the way down to these deep levels, and that its structure changes as we probe further down. Like seeing only the tips of icebergs, Jupiter’s stripey clouds are just the very top of a fascinating, variable layer that we’ll explore in great depth as Juno continues its mission in 2017.